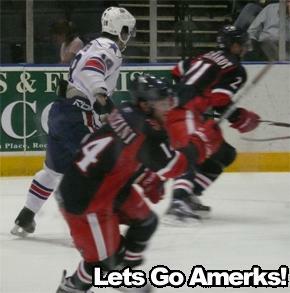 Mancari's Last Minute Goal Not Enough For Two · Let's Go Amerks! Â It was another tough night for the Rochester Americans tonight when they failed to pick up two points after holding a lead againt the Grand Rapids Griffins for two periods.Â The Amerks did take the game all the way to a shootout, which is good for one point in the standings. The first period started off slow for the Amerks leading up to yet another Adam Dennis penalty.Â He received two minutes for tripping at 14:36 in the first period to line up a power play goal for the Griffins, allowing them to get first blood. This seems to be a regular occurance with Dennis who less than a week ago foiled all chances of a comeback when he got a delay of game penalty with two minutes left against the Manchester Monarchs on Friday. After that, things began looking up for the Amerks when the Griffins started taking rediculous penalties one after another.Â At 16:53, Ryan OulahenÂ tripped Stefan Meyer and received two minutes for that.Â Unfortunately, Meyer also ended up in the box for diving, making it 4-on-4 on the ice. At 18:18, Jonathan EricssonÂ got a two minute penalty for holding, giving the Amerks a brief 4-0n-3 opportunity.Â This turned into a much longer 5-on-3, when Mark CullenÂ got two more minutes at 18:49 for throwing equiptment when he threw a stick to a teammate who had broken theirs. The Amerks capitalized from the mistakes of the Griffins when Stefan Meyer scored his 12th goal of the season at 19:31 assisted by Marc-Andre Gragnani (20th assist) and Andrej SekeraÂ (9th assist). A few minutes later (3:42), Adam Taylor received a 5-minute major for high sticking.Â The Amerks were able to successfully kill off that penalty.Â During Taylor’s major, Dylan Hunter gotÂ two minutes for tripping Jonathan Ericsson.Â Ericsson also gotÂ two minutes for diving.Â The ref appeared to think everyone was diving tonight. Stefan Meyer put away another one (his 13th of the season) in the second period to give the Amerks the lead at 9:13. The Griffins didn’t wait long to tie up the game going into the third period.Â At 1:32, Carl CorazziniÂ ripped one past Adam Dennis. Jakub Kindl gave the Griffins the lead at 8:32 when he scored with a clean pass from Mark Hartigan. The outcome of the game was looking bleak after that until Adam Dennis escaped to the Amerks’ bench in favor of an extra attacker.Â Peter Aston gave Mark Mancari the puck who then tapped in his own rebound to tie up the game with only 30 seconds left.Â This was Mark’s 12th goal and Peter’s 6th assist of the season. The Amerks took the game into a shootout with the help of some great saves from Adam Dennis during overtime. Mark Cullen was the only person to score a goal in the shootout giving the Griffins the win and two points for the night.Â This was the Griffins first win against the Rochester Americans this season. Adam Dennis madeÂ 25 saves in the Amerks’ defeat. Franklin MacDonald was out tonight with the flu and Mike Card is still the Amerks’ only injury with a concussion.Â Patrick Kaleta and Clarke MacArthur are both still with the Buffalo Sabres.Â Anthony StewartÂ and Tanner Glass areÂ also still on recall from the Florida Panthers. The Amerks will remain in Grand Rapids until Friday when they will once again take on the Griffins at 7:05 PM.Â The game can be heard on Hot Talk 1280 WHTK, whtk.com and can be watched live on B2 networks.